Do you remember the cocktail that we wrote about a few journal posts back? Not only is it now officially on our brand new cocktail menu, it was also head bartender Martin’s entry cocktail into the Diageo World Class Competition. Landing in the top 10 and stirring alongside The Netherlands’ finest mixologists is a moment that simply will not pass us by. 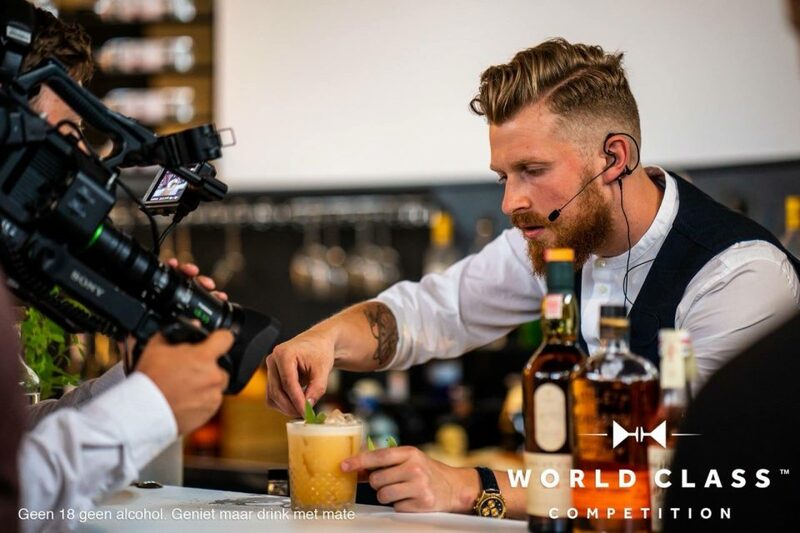 The Diageo World Class Competition took place in June this year at Taste of Amsterdam. A beautiful setting, with an abundance of ambition and anticipation from the contestants. The themes this year were “Wanderlust” and “Signature Serve”, allowing the bartenders to create something far away from but also close to home. Martin’s storytelling nature and green bartending techniques take centre stage in his quest to make it to the top of the World Class Competition. The competition comprises of taste tests and mystery box challenges among others. Being in the top 10, Martin partook in a few challenges and created two cocktails which deserve a storybook of their own. As we know, pineapple is not only a bartender’s favourite fruit, it is also the fruit of hospitality. The first of his cocktail creations was called “Welcome”. He used pineapple to recreate memories of visiting his grandmother as a child as she always had pineapple biscuits in her old steel cookie box. As Martin is known for his root to leaf bartending, it only seemed natural to deconstruct a whole pineapple as an ode to his grandmother’s delicious cookies and use every bit in his cocktail creations. The first being a pineapple pulp, oolong tea, orange blossom, lime, Ketel One vodka cocktail served with a blue spoon in a vintage tea cup. This surely did the trick as a palette cleanser. The next cocktail was aimed at letting Zacapa 23 Rum be the star of the show, and deconstructing pineapple in 6 different ways, in a way that only Martin knows how, to compliment this. Think pineapple crisps, pureed and diced pineapple, a spiced pineapple shrub, and then use the pineapple pieces to create a chutney with chilli, lime, vinegar and sugar. A pineapple spray was made by cooking the peel sous vide in Talisker whiskey. This stirred cocktail is served over ice, in a cookie box, lined with all the spices used, and garnished with a pineapple crisp, grated lime peel and chutney. Let’s not forget how smoked vanilla bitters and barrel-aged whiskey bitters add a certain aroma and bite to the overall flavour of this serve. The jury of the competition picked the top four cocktails, of which Martin more than made the cut! Being more excited than nervous, he proudly took being one of the top four Dutch Bartenders home. Bluespoon is immensely proud of you!